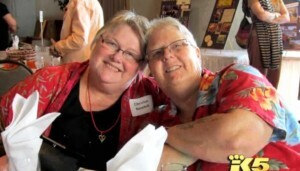 SEATTLE — Two United Methodist ministers recently ‘wed’ each other in a ceremony in Seattle, Washington despite the possibility that they could face disciplinary action for violating Church law. Joanne Carlson Brown, 60, of Tibbetts United Methodist Church and Christie Newbill, 65, of Woodland Park United Methodist Church tied the knot at a ceremony at Brown’s church on December 7th. District Superintendent Patricia Simpson officiated the ceremony, which was attended by approximately 300 supporters. Simpson said that she prayed about officiating the ceremony before she agreed to perform the union. Consequently, Brown and Newbill—as well as Simpson—could be disciplined or defrocked for violating Church doctrine. “[This could lead] to losing my ordination, which could pain me to no end,” Brown acknowledged. She told reporters that she doesn’t see her relationship as being sinful. But Newbill advised that she viewed her decision as being more important than upholding the Book of Discipline. “Living my life true to myself and to God—and authentically with everyone else—I think that is the most important thing,” she said. In 2007, he traveled to Massachusetts to officiate a ceremony between his son Tim and Tim’s homosexual partner. When he refused to repent, and even wore a rainbow stole to show his advocacy for homosexuality, he was ordered to repent within 30 days or hand in his credentials. He refused to do either, and was officially defrocked on Thursday.